You'll be ready to blast away your targets right out of the box with this Marksman 2000K Air Pistol Complete Shooter's Kit! 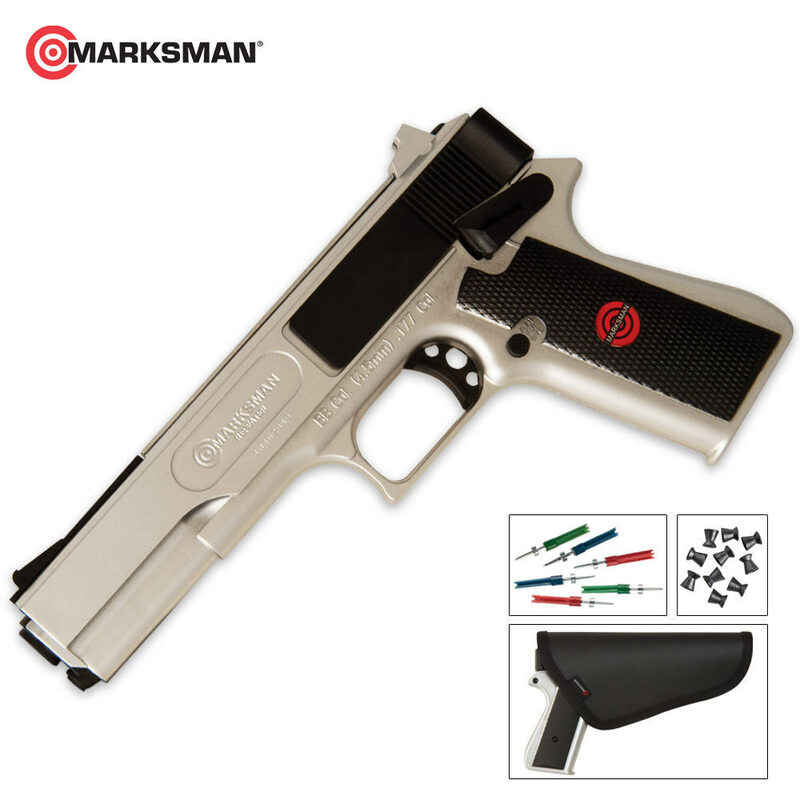 This quality air pistol fires pellets, darts and BBs, with a velocity of up to 200 feet per second. The air pistol features full plastic body construction for an authentic look and feel and a realistic weight with a cross bolt safety feature. It fires 18 shots before you have to reload, and it comes with a speedloader and holster to keep you in business. 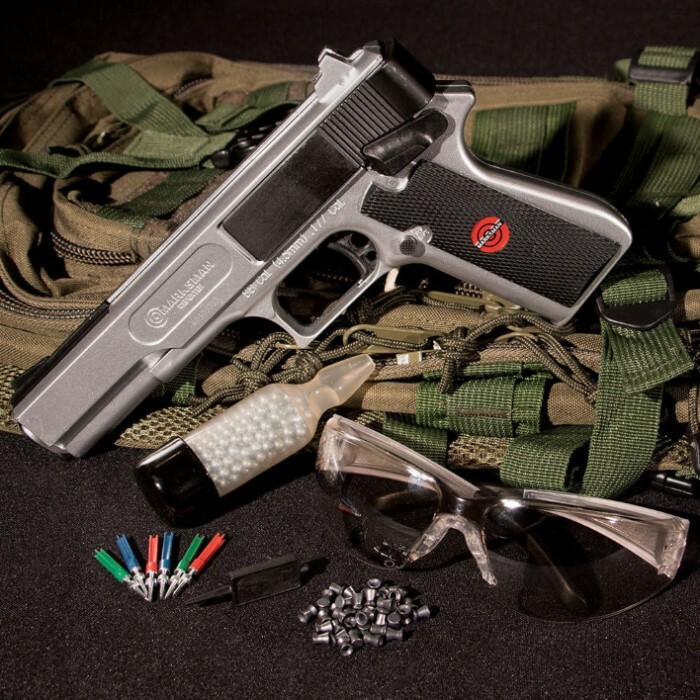 This kit includes the silver air pistol, safety glasses, the BB speedloader, and the holster. It also includes 50 wadcutter BBs, 6 mohair darts, 300 BBs, a loading tool and matching hard shell holster. I gotten this for Christmas and it was in perfect condition. It was packaged nicely and it had everything that Budk featured. Now i'm not the person that likes to give bad reviews on items but the sights were not level, the slide lock was malfunctioning and the bbs would jam, but this pistol I gotten was still very good. Even though is pistol had malfunctions, I was still happy with my order. Also this pistol had great power and fast reload. 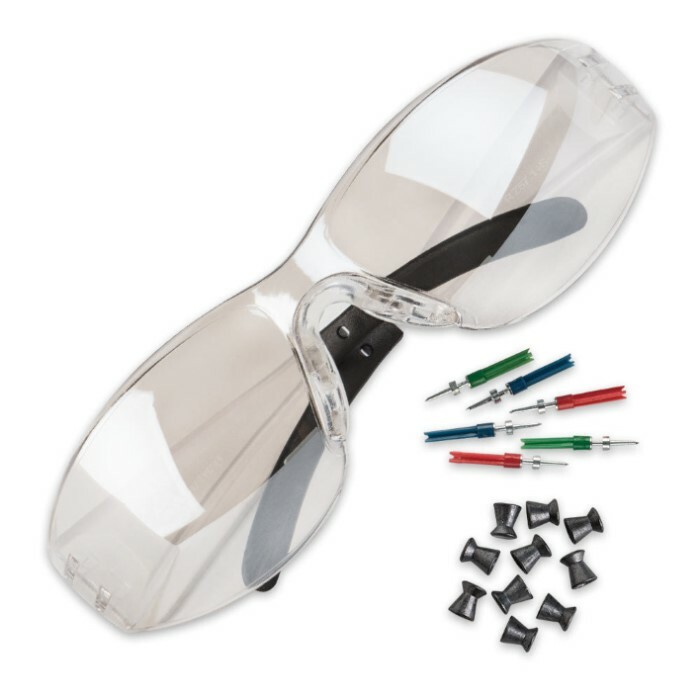 It also features a hard plastic shell that is durable and metal parts. I would recommend this for anyone that likes to have kits with bb guns or a gift for anyone. Thanks Budk you have amazing items that are in amazing condition. It's a good product, it works, but I wouldn't recommend it because it has a plastic shell instead of a metal shell. Unless it's a nerf dart gun any sort of firearms is safest with a metal shell. I recently purchased three of these guns, and was really surprise. I've been in the military for over 33 years, and handled a lot of weapons. For the cost, I was very please with everything that came with gun. I would recommend this to any family, that want's to have a little fun and competition between family and friends. Looking for a cheap shooter. This piece is not a 'cheapo' and is well made. The ammo makes it a cheap shot. Compare the price of 'bb's' to that of 22cal. ammo and you will seem my point. This gun isn't terrible for really close range target practice the shooting is wayyyyy off target. The fact that it says it shoots 200 FPS is kind of a lie I can practically run faster and I am 14!!!! Do not recommend!!! This gun does not shoot "as fast as you can pull the trigger" due to the fact that it is a spring pistol that needs to be cocked before every shot, and if you're looking for appearance, this is not the right thing. A great starter for target practice though. I would recommend the Crosman Magnum. It is a much better gun and very satisfying to wield.